Opening later this Summer just a couple miles north of UnderConsideration headquarters is the Black Star Co-Op Pub and Brewery, providing a fresh take on the co-op model. And by fresh I mean it involves beer and a place to eat some pub grub along with it or, as founder Steven Yarak, says “Why shouldn’t you own the pub you drink at?!”. Black Star’s member-owners also have a say in what the beers taste like, participating in tastings with Black Star’s own brewer, Jeff Young, who will be creating beers under three categories: Rational, Irrational, and Infinite. In preparation for their opening, Black Star has a new identity designed by Austin-based Ptarmak. 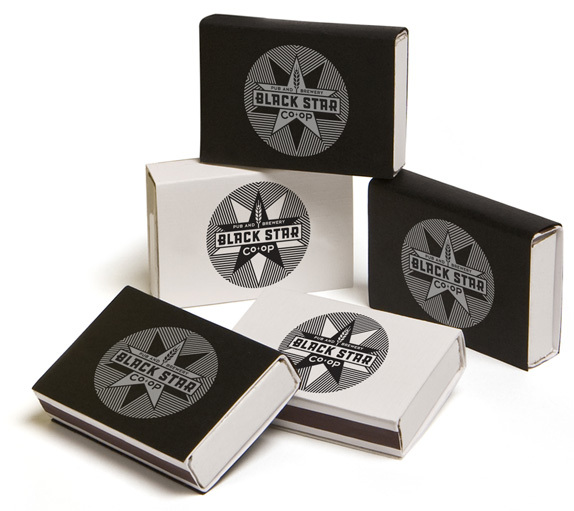 Black Star was looking for a logo that would express the power of a local cooperative. It had to convey a sense of authority without appearing too socialistic. The model of a co-op demonstrates the true meaning of the democratic process and Black Star wanted to exemplify this in an Austin TX kind of way. So it needed to be fresh and non-stodgy amongst the wealth of traditional visuals associated with beer culture. It needed to be fun and laid back in a serious way. The original logo looked like what you would expect a co-op logo to look like, kind of dopey and home-brewed (pun intended). So it’s nice to see a bold and, dare I say, professional identity forged around a co-op concept. The new logo is cool, edgy and bold while actually managing to convey a few different meanings: A little bit of that socialist feel as mentioned above, a little amber hue and the ever popular barley to go with beer, and a slightly hypnotic line pattern for a dose of Austin weird. And so we end the week with a close-up of beer. Enjoy. 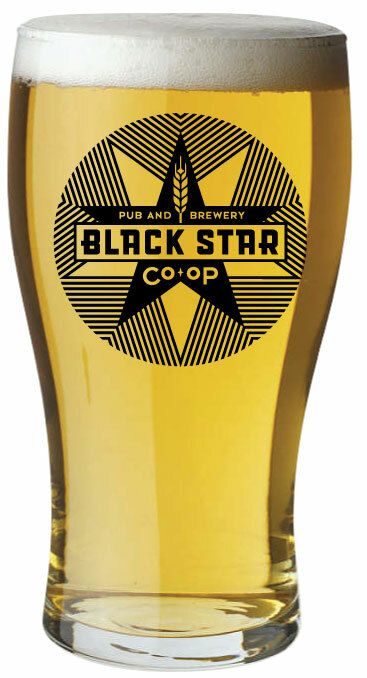 Opening later this Summer just a couple miles north of UnderConsideration headquarters is the Black Star Co-Op Pub and Brewery, providing a fresh take on the co-op model. And by fresh I mean it involves beer and a place to eat some pub grub along with it or, as founder Steven Yarak, says \"Why shouldn't you own the pub you drink at?!\". Black Star's member-owners also have a say in what the beers taste like, participating in tastings with Black Star's own brewer, Jeff Young, who will be creating beers under three categories: Rational, Irrational, and Infinite. 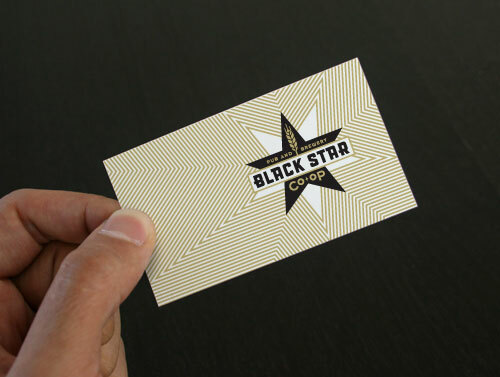 In preparation for their opening, Black Star has a new identity designed by Austin-based Ptarmak.